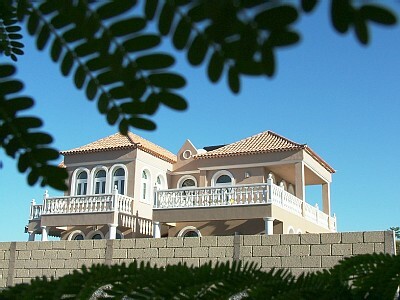 Villa Canuta is a luxurious detached villa in the Fanabe/Del Duque area of Tenerife. It has a private heated pool with an extensive sun terrace, which has been well equipped with ample sun loungers and sun umbrellas. The steps which lead down to the pool are gated, making it very child friendly. There is also a covered terrace with comfortable seating and a dining area. There is even a covered outdoor kitchen with barbeque. There are four bedrooms and four bathrooms, including 3 double rooms with king-size beds and 1 twin room. The living area is spacious with comfortable sofas and satellite TV for entertainment as well as a DVD player and music centre. There is a large dining table and chairs for 8 people. The kitchen is well equipped including a washing machine and dishwasher. There is also wi-fi internet available and a games room with a table tennis table. The villa also has air conditioning. The owners can provide a cot and highchair on request for no additional cost.